This book describes product architecture, configuration, tools, APIs, and schema for Directory Server and Directory Proxy Server. This Reference is intended for directory service administrators, designers, and developers. Review pertinent information in the Oracle Directory Server Enterprise Edition Release Notes. 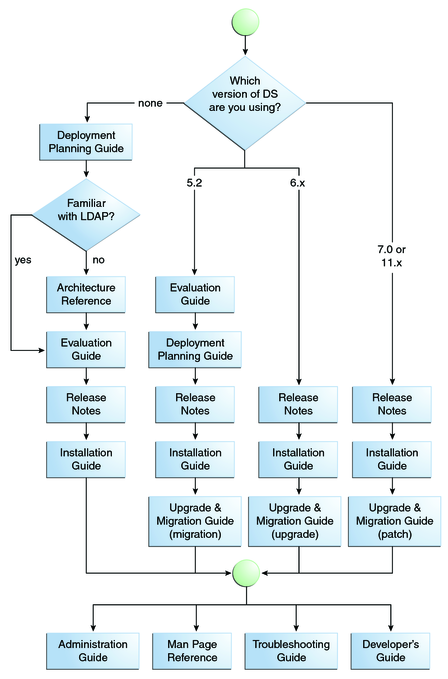 If you are deploying Directory Server Enterprise Edition software in production, also review pertinent information in the Oracle Directory Server Enterprise Edition Deployment Planning Guide. Chapter 1, Directory Server Enterprise Edition File Reference describes the installed product layout. Part I, Directory Server Reference covers Directory Server features and architecture. Part II, Directory Proxy Server Reference covers Directory Proxy Server features and architecture. This documentation set explains how to use Oracle Directory Server Enterprise Edition to evaluate, design, deploy, and administer directory services. In addition, it shows how to develop client applications for Directory Server Enterprise Edition. The Directory Server Enterprise Edition documentation set is available at http://download.oracle.com/docs/cd/E20295_01/index.htm. The following table lists the documents that make up the Directory Server Enterprise Edition documentation set. Contains the latest information about Directory Server Enterprise Edition, including known problems. Introduces the key features of this release. Demonstrates how these features work and what they offer in the context of a deployment that you can implement on a single system. Explains how to plan and design highly available, highly scalable directory services based on Directory Server Enterprise Edition. Presents the basic concepts and principles of deployment planning and design. Discusses the solution life cycle, and provides high-level examples and strategies to use when planning solutions based on Directory Server Enterprise Edition. Explains how to install the Directory Server Enterprise Edition software. Shows how to configure the installed software and verify the configured software. Provides instructions for upgrading versions 11.1.1.3, 7.x, and 6 installations, and instructions for migrating version 5.2 installations. Provides command-line instructions for administering Directory Server Enterprise Edition. For hints and instructions about using the Directory Service Control Center, DSCC, to administer Directory Server Enterprise Edition, see the online help provided in DSCC. Introduces technical and conceptual foundations of Directory Server Enterprise Edition. Describes its components, architecture, processes, and features. Describes the command-line tools, schema objects, and other public interfaces that are available through Directory Server Enterprise Edition. Individual sections of this document can be installed as online manual pages. Shows how to develop directory client applications with the tools and APIs that are provided as part of Directory Server Enterprise Edition. Provides information for defining the scope of the problem, gathering data, and troubleshooting the problem areas by using various tools. Provides general guidelines and best practices for planning and deploying Identity Synchronization for Windows. Describes how to install and configure Identity Synchronization for Windows. Provides installation instructions for Identity Synchronization for Windows 6.0 SP1. For an introduction to Directory Server Enterprise Edition, review the following documents in the order in which they are listed. The SLAMD Distributed Load Generation Engine is a Java application that is designed to stress test and analyze the performance of network-based applications. This application was originally developed by Sun Microsystems, Inc. to benchmark and analyze the performance of LDAP directory servers. SLAMD is available as an open source application under the Sun Public License, an OSI-approved open source license. To obtain information about SLAMD, go to http://www.slamd.com/. SLAMD is also available as a java.net project. See https://slamd.dev.java.net/. Java Naming and Directory Interface (JNDI) supports accessing the Directory Server using LDAP and DSML v2 from Java applications. For information about JNDI, see http://www.oracle.com/technetwork/java/jndi/index.html. The JNDI Tutorial contains detailed descriptions and examples of how to use JNDI. This tutorial is at http://download.oracle.com/javase/jndi/tutorial/. Identity Synchronization for Windows uses Message Queue with a restricted license. Message Queue documentation is available at http://www.oracle.com/technetwork/indexes/documentation/index.html. Identity Synchronization for Windows works with Microsoft Windows password policies. Information about password policies for Windows 2003, is available in the Microsoft documentation online. Information about the Microsoft Certificate Services Enterprise Root certificate authority, is available in the Microsoft support documentation online. Information about configuring LDAP over SSL on Microsoft systems, is available in the Microsoft support documentation online. Directory Server Enterprise Edition does not provide any files that you can redistribute. This section explains the default paths used in documentation, and provides locations of commands on different operating systems and deployment types. The table in this section describes the default paths that are used in this document. For complete descriptions of the files installed, see Chapter 1, Directory Server Enterprise Edition File Reference. Represents the base installation directory for Directory Server Enterprise Edition software. When you install from a zip distribution using unzip, the install-path is the current-directory/dsee7. When you install from a native package distribution, the default install-path is /opt/SUNWdsee7. Represents the full path to an instance of Directory Server or Directory Proxy Server. Documentation uses /local/dsInst/ for Directory Server and /local/dps/ for Directory Proxy Server. No default path exists. Instance paths must nevertheless always be found on a local file system. Depends on your installation. Note that the concept of a serverroot no longer exists for Directory Server and Directory Proxy Server. The table in this section provides locations for commands that are used in Directory Server Enterprise Edition documentation. To learn more about each of the commands, see the relevant man pages. The following table explains symbols that might be used in this book. Contains optional arguments and command options. The -l option is not required. Contains a set of choices for a required command option. The -d option requires that you use either the y argument or the n argument. References the value of the com.sun.javaRoot variable. Press the Control key while you press the A key. Press the Control key, release it, and then press the subsequent keys. Indicates menu item selection in a graphical user interface. From the File menu, choose New. From the New submenu, choose Templates. Discuss technical problems and solutions on the ODSEE Discussion Forum and the Directory Services blog. Download ODSEE 11g Example Files.